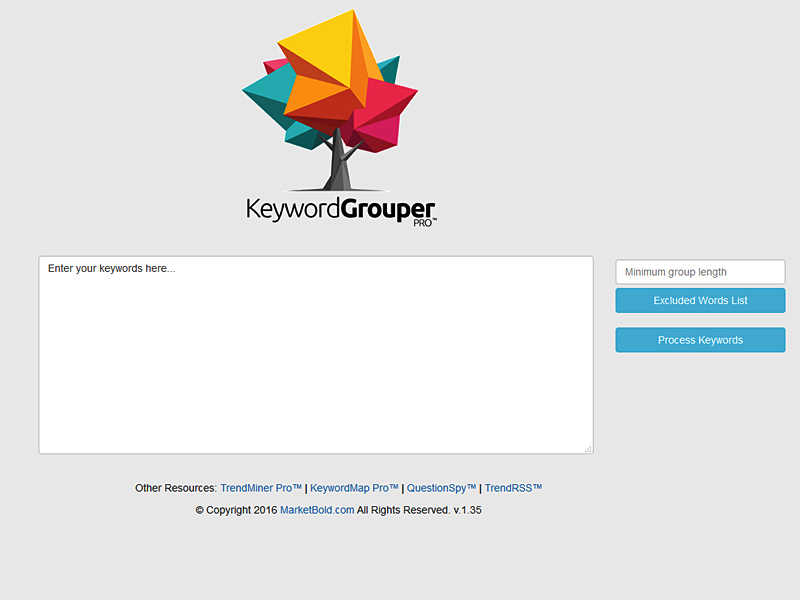 Keyword Grouper Pro groups your keywords into tight, relevant keyword groups. You simply paste in your list of keywords and Keyword Grouper Pro will analyze every keyword against all other terms and group them according to the grouping settings.You have the option to omit certain words from being used as groups, as well as the size of the group, so you can use word frequency to determine which groups are created and which groupings are not.There is a full video training playlist available upon download that will walk you through how to group keywords, how to use Keyword Grouper Pro to perform market research and find profitable niche markets.Keyword Grouper Pro can also be used as a negative keyword tool to help you find terms in your keyword list that you want to exclude from your pay-per-click (PPC) campaigns and paid advertising campaigns.You can also use Keyword Grouper Pro for content marketing. By inputing a list of questions that the market is asking about your products and services, and then grouping those questions around the most common words and phrases, you can instantly see which topics are the most important to your market. This helps you with your SEO and content marketing selection so you know what to write about.You can copy all the keywords or just individual groups. You can export the terms to a .csv file to open in Microsoft Excel or OpenOffice as well.By grouping your key words into smaller, more focused groups, you can lower your CPC and increase your Quality Score. You can also find new keyword opportunities within a large keyword list that you would have overlooked otherwise. This provides you with new marketing opportunities to reach your target audience and put your products and services in front of them.Keyword Grouper Pro is completely free to use and works directly in either Chrome or Firefox. It works on both Windows and PC and there is no installation, just unzip the file and begin grouping your keywords.